Transactions of cash and cheques must be followed, recorded and managed appropriately, in order to make sure that all of the transactions are organized and updated. Hyper allows the accounting manager to manage the cash and the cheques of the organization by using the tools and the information displayed in this tab. Cash Management - this tab gathers and displays the cash transaction in the organization. For further information, please read the next section. Receipts Cheques - manage the cheques receipts cheques, deposit cheques, manage bounced / replaced cheques and postpone cheques. For further information, click here. Printed Cheques - display the printed cheques, create and print new cheques. For further information, click here. The primary sub tab is used for managing the cash in the organization, displays the cash transactions according to the filter fields and allows to deposit / withdrawal cash, as described in the following section. The filter fields - Select the required filters for the report. Transactions table - This table displays all of the cash transactions. Calculated Balance - The cash balance, according to the filter definitions. Action buttons - the actions buttons at the top of the table are used for cash deposit and withdrawal. Please note - the actions buttons are not available when using the filter fields. From / Till Date The required transactions time-frame for the report. From / Till Total Amount The required transactions amount. Currency The required transactions currency. Leave this field empty to display the transactions of all currencies. Agency Select the agency of the required transactions. Drawer / Station ID Fill in the number of the drawer / station of the required cash transactions. After choosing the required filters, press the Execute Report (F5). The results will be displayed in the table. 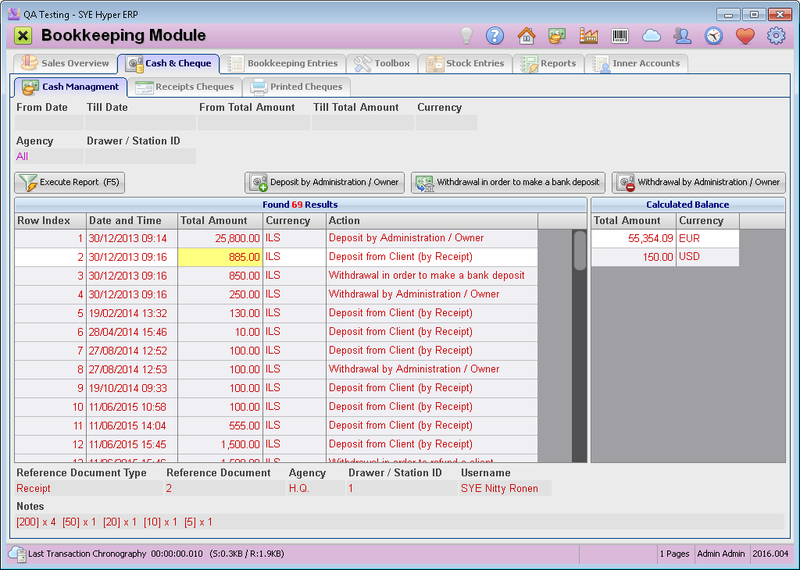 The transactions table displays the cash transactions according to the defined filters. Additional customized information fields are displayed at the bottom of this table. Click on required cash transaction record to view its details. This table calculates the cash balance of the organization, according to the displayed transaction in the results table. The balance will be automatically calculated after every deposit / withdrawal. There are three action buttons in this tab. These action buttons are not available when using the filter fields. Deposit by Administration / Owner - This action button is used for updating a cash deposit of the administration / owner. After pressing this button, fill in the deposit details in the following window. A new cash transaction record will be added to the cash transactions table. Withdrawal in order make a bank deposit - This button is used to report a bank deposit of cash withdrawal. After pressing this button , fill in the withdrawal details for the bank deposit in the following window, and print the withdrawal form. A new cash transaction record will be added to the cash transactions table. Withdrawal by Administration / Owner - Fill in the withdrawal details and press the OK (F6) button. Search for the required bookkeeping account for the withdrawal and press the Select button. Please note - This action creates a Bookkeeping entry. In order to make a withdrawal by administration / owner, define the inner accounts of the organization. Use the Inner Accounts tab of the Bookkeeping Module.